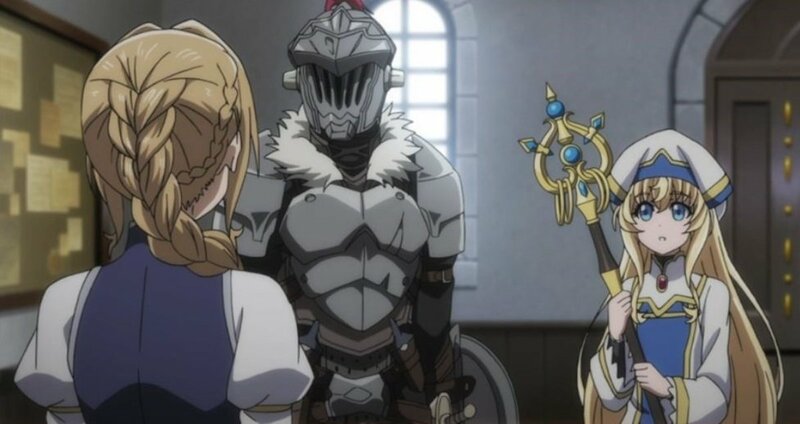 Goblin Slayer is the one in armor, like his title suggests he slays goblins. He is obsessed with goblins and nothing else. He is now an expert in handling goblins. Priestess is a new adventurer that befriends the Goblin Slayer. She is now part of his party and act as the main healer. 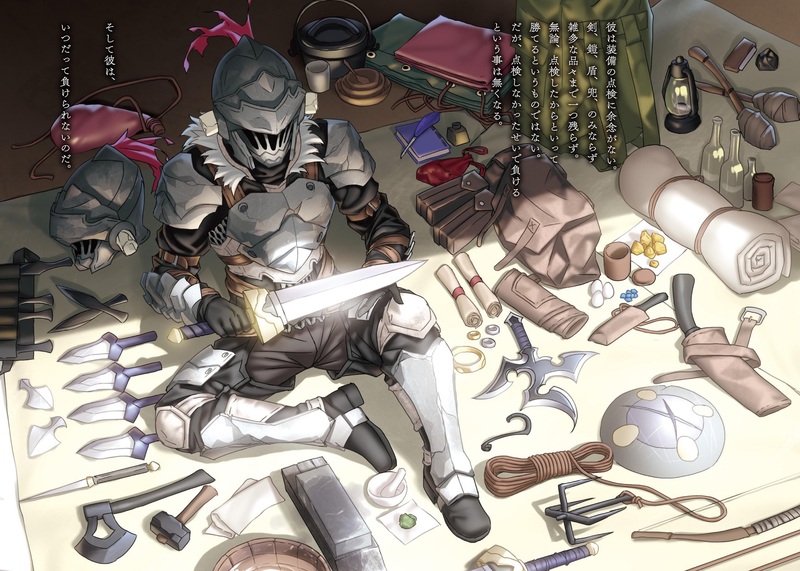 The follows Goblin Slayer during his goblin extermination and his off time. Sometimes he gets a quest that is outside just killing goblins, but that is about it. The best part of the show is the methodical way the Goblin Slayer goes about taking care of goblins. Although he looks like a brute berserker, he is a methodical specialist. His armor, his sword, his items… all of them are tailor selected for purpose of extermination. And that is what he sees himself as, a pest exterminator. I wish the show focused more or the detail of his methods than … I don’t know… cute girls. The tone of the show is very inconsistent. I talked about how the first episode is suppose to set the tone of the series. And Goblin Slayer does a terrible job of this. A lot of people says the show is dark, but to be more specific, only the first and part of second episode is dark, the rest are not that bad. The later episodes become more comedic and light, bordering on slice of life. And I think this is a problem. People tend to compare Goblin Slayer to Berserk in similar tone of messed up-ness. I have to disagree. Berserk has dark moments rather frequently through out the series, showing that the world is messed up from all angles. And like mentioned above, Goblin Slayer only does this on episode 1. I think Goblin Slayer needs to lighten the first episode or have more hard hitting dark moments through the series. I have not read the light novel, so there might be hope there. Art style of the series is crucially important, the art should service the story in tone and raise it to the next level. And Goblin Slayer’s art style is so mismatched from the show. Only Goblin Slayer fit into the scene. All of the other characters look adorable and clean. I assume this was a misguided attempt at parody or satire, but Goblin Slayer does not go far enough in this route. The series that does this well is Mahou Shoujo Madoka Magica, an entire series dedicated to rattle the magical girl genre. This is a small issue, but the 3D models in this show are noticeably bad. The Goblin Slayer, you know, the protagonist, uses a lot of 3D model. And it is very noticeable. In one scene, I noticed that one of the 3D models did not have shadows…. Will I watch it again? No, once was enough, I don’t think anything is worth revisiting. Do I recommend it? Not really. If you want something truly messed up there are other better series. If you want fantasy world, there are other better series. You should see this if you want to see what the fuss is about. I got interested in Goblin Slayer because I heard it was dark like Berserk. Sadly, it had a click-baity first episode that caused an uproar and the rest of the season was meh. That is how I feel about the show… meh.